Studio Line: Warner Bros. - In a world of vicious rivalries and violent betrayals only one thing is sure. They've got the weapons. They've got the posses. And they've got no chance against former Hong Kong cop Han Sing. Gravity-warping martial arts, cool visual effects and an all-star music track combine in this revved-up action movie from producer Joel Silver (The Matrix) and starring Jet Li (Lethal Weapon 4) in his first English-language lead role. Li plays rough-and-ready Han, who shares an attraction with Trish O'Day (screen-debuting songstress Aaliyah) even though their families are rivals in a fierce Oakland turf battle. The two also share plenty of danger as they try to find the real cause of the blood feud. No gun, no posse? No problem. 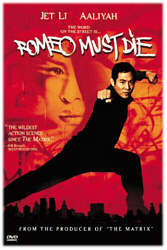 With Jet Li going to war as only he can, Romeo Must Die is alive and kicking. Box Office: Budget: $25 million. Opening Weekend: $18.014 million. Gross: $55.973 million. DVD: Widescreen 2.35:1/16x9; audio English DD 5.1, French DD 5.1; subtitles English, French; closed-captioned; single side - dual layer; 39 chapters; rated R; 115 min. ; $24.98; street date 8/1/00. Supplements: 13 Behind-the-Scenes Documentaries; 3 Music Videos; Filmographies; 2 Theatrical Trailers. Enhanced Features For Your DVD-ROM PC: Interactive A Martial Arts Experience Challenge; Web Events and Chat-Room Access; Original Theatrical Web Site; Sampler Trailers. A scan of IMDB shows a whopping 88 theatrical films that have included the word "Romeo" in their titles. There are also 38 movies with "Juliet" in their names. While not each and every one of these retells Shakespeare's classic tale in some way, it's a good bet that quite a few of them do, and that leaves out adaptations with neither name in the title, such as West Side Story. However, it seems likely that Romeo Must Die is the first hip-hop flavored, Hong Kong action film influenced retelling of Romeo and Juliet. It's also one of the loosest variations on that story; while I see the similarities, they're so tenuous that they would have not seemed apparent if the title didn't use the name "Romeo". Basically RMD retains the concepts of two families that don't like each other but a boy from one and a girl from the other develop a relationship. That's it - I saw no other apparent similarities, especially since R&J is a tragic romance, but RMD features no romance and the only tragedy comes from the wasted talent on screen. Jet Li first became known to a widespread US audience through his role as a baddie in 1998's Lethal Weapon 4. He stole the show with his high octane kinetics and offered the only watchable and entertaining parts of that film. Despite the fact I enjoyed his work in LW4, I didn't bother to see subsequent Li offerings like Black Mask because they simply didn't look very interesting. I passed on RMD during its theatrical run for the same reason; I thought it seemed silly and lame. My initial impressions were pretty much on-target. RMD isn't a terrible movie but it seems disappointing and mediocre. As I noted, the story itself possesses only the most tenuous connection to Shakespeare; for the most part, it appears like little more than a fairly standard action flick with an insidious plot behind some bad behavior. In some ways, it's something of a mystery, since we follow Han (Li) as he attempts to find out who killed his brother and who's stirring up a violent ruckus between the two opposing families. Unfortunately, the mystery has little tension, since it always seems fairly obvious who's causing the problems. That means we're left with two possibly redeeming aspects of the movie: the action and the interaction between our main characters, Han and Trish (Aaliyah). The latter aspect seems quite dull. I saw little chemistry between the two leads, which is more acceptable since the story features absolutely no romantic interaction between them, although such a pairing seems natural and is implied. Is this touchiness to the interracial aspects of this couple? Perhaps, or maybe the filmmakers just figured - probably correctly - that the audience for this kind of flick doesn't care about romance. In any case, I thought Li and Aaliyah displayed little connection and spark. The one semi-exception to that rule occurs during them movie's best action sequence, one in which Han refuses to hit a female who attacks them. Instead, he uses Trish as his violent puppet, and the result is the only fresh and creative aspect of the film. Although one expects exciting action from one of Li's movies, I didn't think much of those scenes. The fight scenes weren't bad, really, but they lacked much spark. Part of this is because Li seems like such an awesome battler; as a result, none of his opponents present a believable challenge. We find a decent foe by the end of the movie, but since this character's growth and involvement were so slim, I didn't really care about this fight; it got no dramatic build-up and is only mildly stimulating. One "innovative" part of RMD I didn't like was a sort of X-ray cam that shows the physical impact of some of the violence. It only occurs maybe three times during the film but I found it gratuitously clever and annoying. A similar device was featured in Three Kings, but it seemed to have a purpose, whereas this feature is nothing more than a stupid gimmick. Although Romeo Must Die isn't a terrible movie, it's a pretty mediocre one. The action isn't very stirring, the acting is never more than passable, and the story itself is weak. Maybe someday Jet Li will make a thoroughly compelling movie, but RMD isn't it. Romeo Must Die appears in its original theatrical aspect ratio of approximately 2.35:1 on this single-sided, double-layered DVD; the image has been enhanced for 16X9 televisions. As one would expect from a brand-new movie, the picture generally looks terrific. Sharpness seems excellent, with a very crisp and defined image that never displays any signs of softness or fuzziness. Moir� effects are a minor concern, and I also noticed a moderate amount of artifacts from the anamorphic downconversion on my 4X3 TV. Print flaws are almost completely absent. I detected a little black grit, but that was it; no grain, no scratches, no hairs, no speckles. Colors are accurate and solid, with no evidence of bleeding, noise or other concerns. Black levels seem very deep and rich, and shadow detail generally looks appropriately opaque, though it can occasionally seem slightly heavy, which is more of a concern than usual since so many participants have dark skin tones. All in all, the movie presents with a fine image that appears nearly problem-free. Also excellent is the Dolby Digital 5.1 soundtrack of RMD. The soundfield seems very involving and broad. All five speakers are intensely active participants in the mix and add a lot to the experience. As usual, the front channels offer most of the audio, and all three are almost always in motion, with effects, music and occasional dialogue emitting from the sides. The rears also kick in a great deal of information; they can really blast the action into overdrive during the more visceral scenes. It's a soundfield that seems perfectly appropriate for a recent action movie. Quality is also generally good though with a few flaws. Dialogue causes the most concerns. Although speech seems intelligible at all times, it often sounds flat and slightly muffled. The tonality isn't atrocious, but it appears weak for such a new film; the dialogue lacks the presence it should display. The other portions of the soundtrack display excellent quality, though. The effects are bold and crisp and pack a solid punch without any signs of distortion. Music also seems bright and clear, with excellent dynamic range. All aspects of the mix offer very strong bass, something that's important for a movie with such a hip-hop flavor. The relatively bland quality of the speech knocks this mix down to an "A-", but it's a solid track. The DVD also features some nice supplements. I was surprised that it didn't include an audio commentary, but it does present a slew of video features. First up is an "HBO First Look Special" called "Making RMD". Unsurprisingly, this 14-minute and 45-second program presents a very promotional look at the film. It shows us some decent clips from behind the scenes but doesn't give us much significant information; its purpose is to make us want to see the movie and not to give us any strong data. It's watchable but unspectacular and puffy. One area of the DVD is called the "Fight Zone". This contains two trailers - one US theatrical and one international - plus a couple of Aaliyah music videos. "Come Back In One Piece" also features movie costar DMX. It's a dull song and a bland video. It incorporates a few film clips but mostly shows some lip-synching by the two performers. The other video is for "Try Again", which is a much better song and a slightly more interesting clip. For once, it includes no segments from the movie itself, though Li guest stars in it. Li gives us a little interaction with Aaliyah, but for the most part, it provides just some blah singing and dancing from her and some cohorts. It's not a great video but it's decent and is much better that the other one. Fans of that clip may be happy to find "Making Aaliyah's 'Try Again' Video", a four-minute and 15-second piece. This gives us a few factoids which are presented as text onscreen plus a lot of clips from the video and some raw footage of the shoot. The latter parts that adds nothing to the experience and the whole thing's pretty dull. The next section is called "Short Documentaries" and it includes eight pieces. Each of these run between 90 seconds and five minutes, for a total of 24 minutes and 10 seconds. Most of these utilize the same format as the "Making of 'Try Again'" piece; they show some clips from the film plus behind the scenes footage and onscreen text factoids. The final three segments - "Jet Li Is Han", "Aaliyah Is Trish", and "Anthony Anderson Is Maurice aka Moron" - consist of interviews with the named actors. Although these pieces aren't bad, there was something about them I didn't much like. I think they come across as somewhat faux-hip and trendy, with information diced up into neatly-digestible segments so MTV-addled attention spans can take in all of the bits. This data would have been much better displayed had it been cut into a coherent documentary; as it stands, the pieces seem like bits of decent stuff but without much quality behind them. Four featurettes also appear. These run between 90 seconds and six minutes, 50 seconds for a total time of 16 minutes, 50 seconds. How these are supposed to differ from the "Short Documentaries" doesn't seem apparent to me, as they follow the same edgy formula with frequent use of the onscreen text factoids. I guess they're a little longer, for the most part, and they concern more technical aspects of making the film, whereas the others are mainly interested in the actors. Overall, I felt the same way about the featurettes as I did the short documentaries; some good information appears, but I didn't care for the format and I wish that one general documentary would have been assembled instead of all these bits and pieces. Finally, the "Cast and Crew" area gives us notes about six of the actors and producer Joel Silver. Actually, these are just filmographies for all of the participants but Aaliyah and DMX; their entries give some basic info about careers, but not much. This area can be skipped without any loss. The same sentiment concerns Romeo Must Die itself. I can't say that I actively disliked the movie, but it left me cold; it seemed mildly watchable for the most part but it lacked any spark or excitement. The DVD presents excellent picture and sound and also includes significant amounts of extras, although I wasn't wild about the way in which much of the latter pieces were presented. Serious devotees of the action genre may want to rent the title, but that's about as much as I can recommend for this fairly bland film.